Water purification is a bit of an obsession of mine. 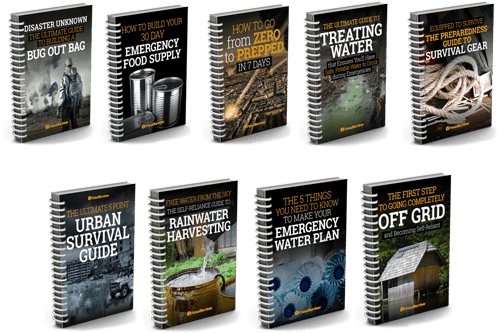 Whether you are planning a backpacking trip or prepping for disaster, clean water is essential. 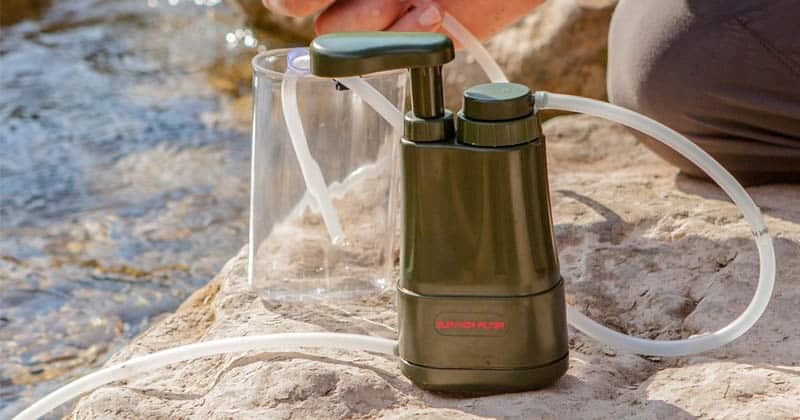 I’ve tried a bunch of water filters, including the Sawyer Mini, Katadyn Pocket, and LifeStraw. I’ve recently discovered the Survivor Filter Pro. Here is my review of it and how it compares to the other filters. The Survivor Filter PRO is a 3-stage water filter which removes bacteria, protozoa, and other harmful particles from water. Overall, the PRO has really good reviews from users and a satisfaction guarantee. Using the Survivor Filter PRO is very easy. You put the input tube into any fresh water source (fresh = not seawater). You can even adjust the floater on the tube so the straw doesn’t go onto the bottom of the water where all the grime is. The output tube goes into your water bottle. Carbon Filter: The carbon filter will remove heavy metals and chemicals from the water. Almost no other water purification method can do this. Ultra Filter: The final stage is a 0.01 micron filter. This filter will remove virtually all viruses from water. Because large particles have already been removed in stage 1, the PRO is able to remove viruses without slowing down the flow rate. If the filter gets clogged, you can just backflush it with clean water. This cleans it out and gets the filter flowing fast again. Note that hollow-fiber filters cannot be frozen after they’ve been used. The water inside the filter membrane will expand, forming holes in the filter. So this might not be the best water filter for winter survival! The Survivor Filter PRO treats all threats that you are likely to come across in a disaster situation or while in backcountry. 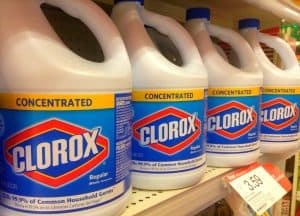 As far as heavy metals and chemicals go, note that these are removed with the carbon filter. But carbon filters do not “catch” impurities like standard water filters do. Rather, carbon absorbs impurities. There is a limit to how much carbon can absorb. The PRO says that the carbon filter has a lifespan of 2,000 liters. But, if the water is really dirty, the carbon will absorb its max capacity faster. There is no way of knowing when the carbon filter as reached its max. In a situation where the water is severely contaminated with chemicals, you’d need to change the carbon filter much sooner. 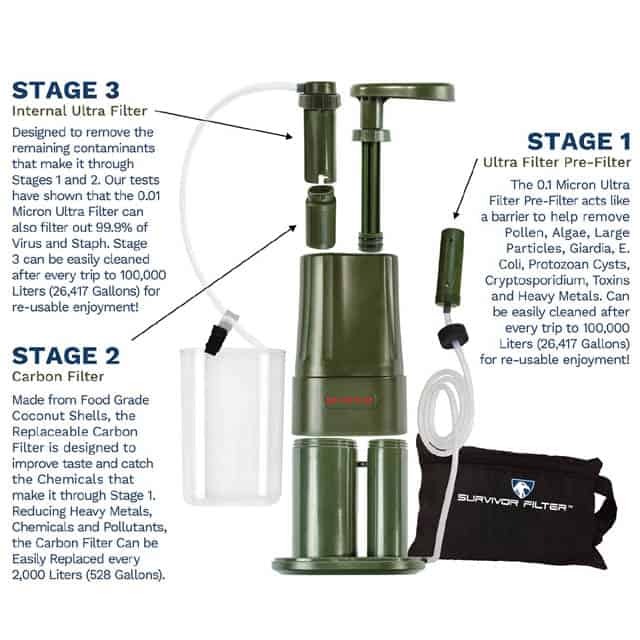 To learn more about carbon filters, read this post about Water Purification Methods. Here are just some of the standout features about the Survivor Water Filter PRO (the good and the bad!). Flow Rate: The PRO has a flow rate of 0.5 liters per minute. This is actually very fast for a filter with a 0.01 rating (smaller pores mean that it takes longer for water to go through the filter). The Sawyer Mini, for comparison, filters at a rate of 0.18 liters per minute but only has a micron rating of 0.1. Removes Viruses: In backcountry, viruses usually aren’t an issue because they don’t live long in water. UV light from the sun will also kill viruses. So, you don’t really need a filter capable of removing viruses for backpacking. But you will absolutely want a virus-removing filter if you are prepping for disaster. During flooding disasters, sewage can contaminate water and be a huge virus risk! 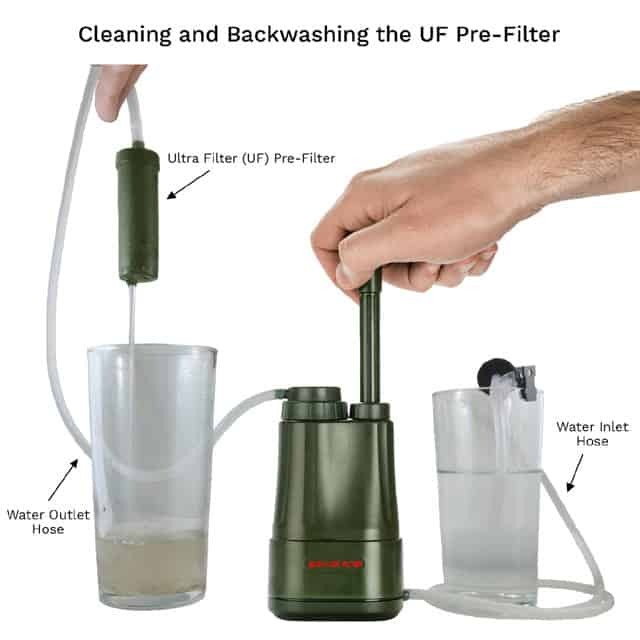 Removes Bad Tastes: Because it has a carbon filter, the PRO will actually get the bad taste out of water (something that hollow-membrane filters won’t do). Easy to Use: The PRO was designed so it is very easy to use. I love that it has a floater on the input tube so the tube doesn’t fall to the scummy bottom of the water source (which would cause the filter to get clogged faster). If the filter does get clogged, you can just backflush it with clean water. Long Filter Life: The filter life of 100,000 liters basically means it will last you forever. 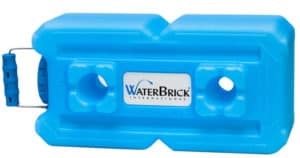 Just be sure to get a replacement carbon filter since those won’t last nearly as long, especially in contaminated water. No Straw: Since the LifeStraw came out, straw water filters have been super trendy. I personally find them impractical. But, if you like drinking directly from the source, you’ll be disappointed that you can’t use the PRO as a straw. Material and Construction: The Survivor Filter PRO is made from a high-quality plastic called ABS. It is pretty durable and sturdy – but is still plastic. Be sure you don’t step on it. I was a bit worried that the pump might break but it has held up well. I’m a big fan of the Sawyer Mini (Amazon Link) because it is so small, cheap, and reliable. However, the Survivor Filter PRO has some major advantages over the Sawyer Mini. The main ones are that the PRO can filter viruses, removes bad tastes, and has a much faster flow rate. The Sawyer Mini is a lot lighter though, which makes it suitable for backpacking. It is also a lot more reliable because there aren’t any moving parts which can break. Bottom Line: Choose the Sawyer Mini for backpacking solo. 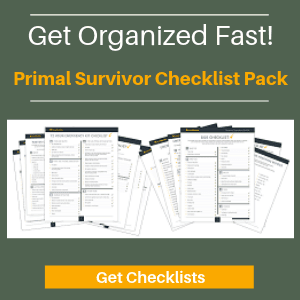 Go with the PRO for disaster prep or backpacking in groups. The Katadyn Pocket (Amazon Link) works a lot like the Survivor Filter PRO. However, it is a completely different type of filter. It uses a ceramic filter which can be removed and cleaned (as opposed to backflushed). This makes it a bit easier to maintain the filter. You’ll also be able to clean the ceramic filter even when you don’t have clean water. Clean water is required for backflushing. While ceramic filters are reliable, they don’t remove viruses. The Survivor Filter PRO beats the Katadyn in this way. The PRO is also better in terms of weight. Why does the Katadyn Pocket cost so much more than water filters which do the same or more? The reason is because the Katadyn Pocket is made from stainless steel (as opposed to plastic). It can really take a beating! You definitely don’t have to worry about the hand pump breaking, and there’s even a 20 year warranty. As one reviewer put it, do you really want to rely on a cheap plastic pump for disaster prep? Bottom Line: Choose the Katadyn Pocket when you want something very sturdy and are willing to pay for it, and have a method for treating viruses if necessary. Choose the PRO if you want an affordable option that can do it all. When it first came out, the LifeStraw was revolutionary. It was the first cheap, long-lasting, and easy-to-use water filter. But the LifeStraw is only a straw. It is really impractical to rely on a straw. You have no way of taking water with you in an emergency situation. The Sawyer Mini only costs a bit more and allows you to use it as a straw and to fill a bottle. 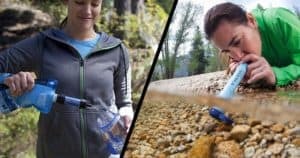 There’s really no comparing the LifeStraw to the Survivor Filter PRO. Bottom Line: Get the Survivor Filter PRO instead. If you really want a straw water filter, then get the Sawyer Mini. Just don’t waste money on the LifeStraw since it is only a straw! Thanks for catching that TX, I have added a link to the manufacturers website also. The Survivor Filter Pro X has been released and can be found at the company’s website: https://survivorfilter.com . The Pro X is an electric version of the Survivor Filter Pro LE model, slightly upgraded and it uses the same filters as well. It has the ability to filter about 1.5 gallons of water in roughly 9 minutes. One thing to note, Activated Carbon does not “absorb”, it “adsorbs” (I.e. it attracts and pulls contaminants to its surface holding on to them). The Pro X – Will try and get our hands on one for a review. Adsorb vs absorb thanks for clarifying the difference but for our purposes I think either works for a simple understanding of the general process and we will stick to the more well known version.